I’m now running behind terribly on the blogging of my trip. I’ve been back for two weeks, but in that time I headed to down to Hobart for 5 days for a series of workshops to sing the Bach St Matthew Passion with the Tasmanian Symphony Orchestra and Chorus as part of the Festival of Voices. So I’m now heading back to Berlin (virtually) to review the last of my food highlights there. Having sampled and LOVED brunch at Kopps I was keen to go back there for dinner. 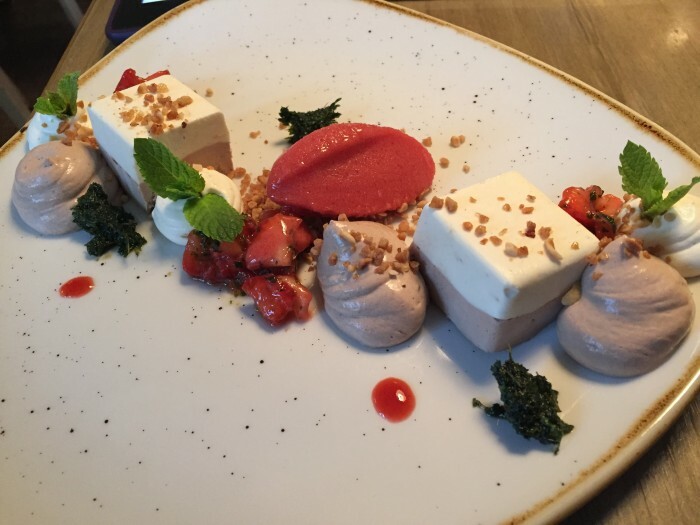 I was also keen to compare it to my other fine dining experience at the Lucky Leek. This was a lovely amuse bouche of a tiny raviolo with a leek cream. 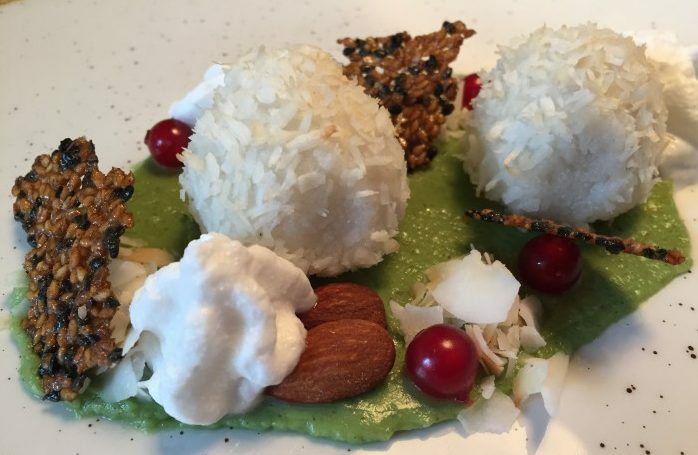 Next up was a dish that sounded more promising in theory than it turned out in practice, coconut polenta balls with avocado and sesame crisps. It was very pretty and pleasant enough, but lacking in real flavour. The sesame crisps were great though. Accompanied by a lovely late picked riesling from the Rhine. 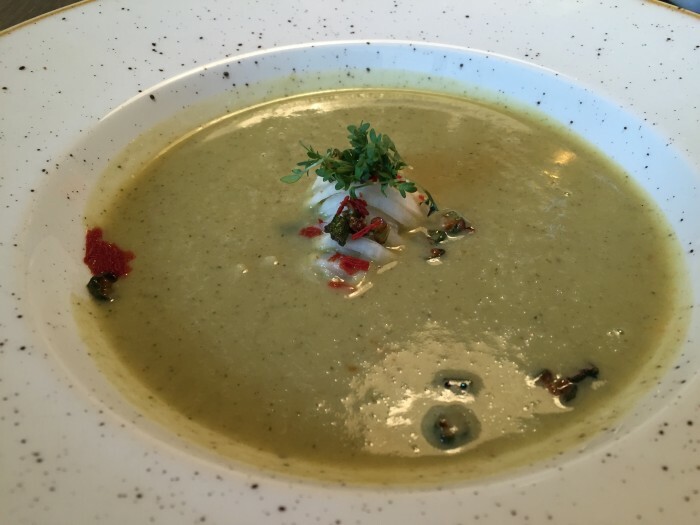 The soup that followed was delicious, which is not something I’d often say about zucchini soup but they had the seasoning in this one just done perfectly. The soup was in fact zucchini and okra with tomato jam and the contrasting crunch of some raw kohlrabi spirals. The wine with this was a German white burgundy. 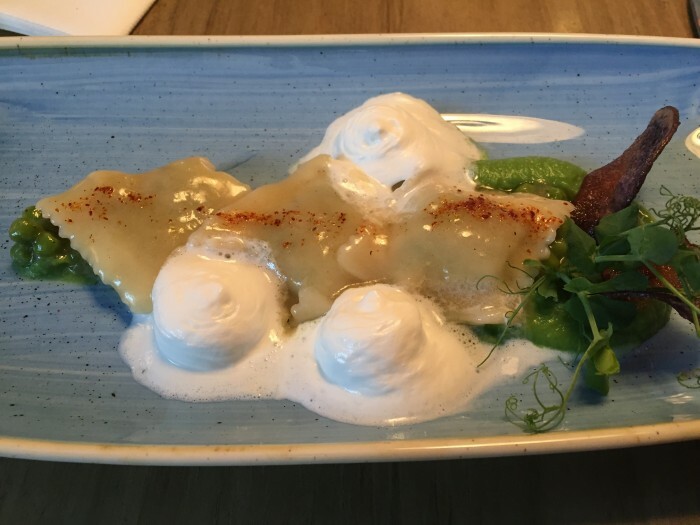 Next up was a pea ravioli dish with pea puree and a mint and coriander foam. Nice enough but not earth shattering and the pasta could have been more delicate. 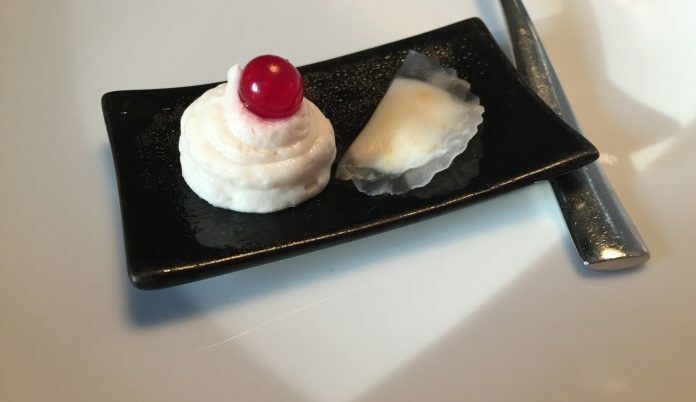 And so far there had been foam on three out of four dishes! This was accompanied by a lovely buttery French chardonnay. Next up my definite favourite of the night. Asparagus season was in full swing in Germany while I was there and they favour big fat white asparagus. It was on the menu everywhere, including here. This dish was just perfect. 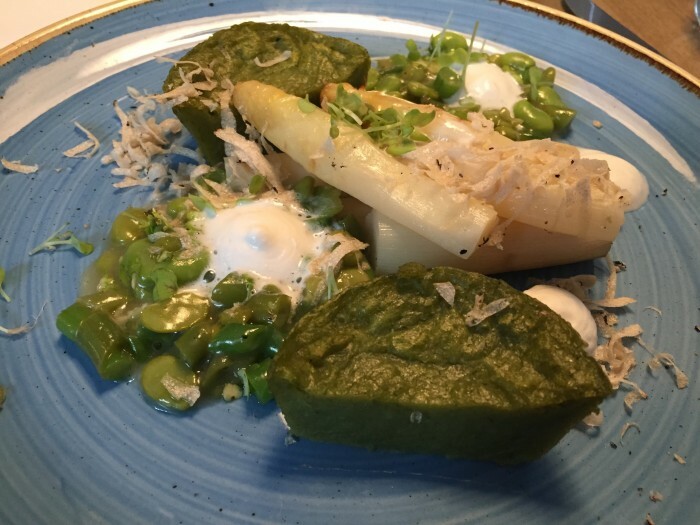 Grilled asparagus, potato and wild leek cakes with broad beans and another foam. This time I could forgive it because it was black truffle foam. This came with a beautiful crisp white from Austria. And then on to dessert. This dessert could have been great, if only the chocolate elements had been dark. I’m being picky, it was faultless in most respects, but it just needed that great bitterness that dark chocolate gives. It was accompanied by a lovely Austrian dessert muscat, not sticky like a lot of Australian dessert wines but light and floral. 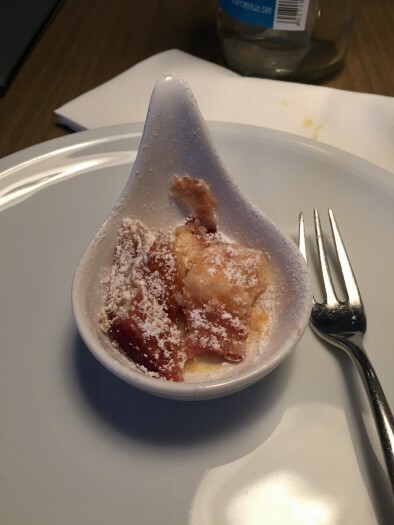 And finally a post meal amuse bouche of a small bite of apple strudel. Delicious. It was good, with a couple of slightly disappointing dishes, but I’m glad I did it. Kopps is still the hands down winner in the perfect brunch category though. For fine dining I enjoyed my meal at the Lucky Leek more, mostly because it was more varied and just a bit more refined.